I will soon plant a potato in a pot or in the garden. I hope to be able to find potatoes that will still sprout. It would be fun growing some of my own. Greenbeans, various cherry tomatoes (sunsweets, sweet 100s, rosellas and brad's atomic grapes), and basil in major production mode now. Zukes, yellow squash, and peppers seems to be ramping up. I've got tons of mature, yet green, larger tomatoes (mortgage lifters, cherokee purple and pineapple). When/if they ripen I think I'm going to be buried in tomatoes. My kale seems to be petering out and my two red cabbages are giving up the ghost as well. Will probably try planting some fall crops towards the end of this month. My two go-to cook books right now are the New Southern Garden Cookbook and Marcella Hazan's Essentials of Italian Cooking. I've eaten fresh food from my garden for the last several meals and it has been glorious! I got basil in the CSA and put it in water on the counter so it didn't go black. It rooted so I planted it out in soil. It will be interesting to see if it produces more shoots. I made a 'pizza' from a huge zuke - grated and press out the water. It was an odd recipe - 8 parts grated zuke, 1 part Parmesan...etc...but it tasted phenomenal and it used up a huge zucchini. The yellow bush beans are super productive. Frugal Lizard - I've seen the idea of making pizza boats with zucchini. Cut in half, hollow out a little bit, fill with cheese and pepperoni, or other pizza toppings that will fit, and consume. Also, zucchini can be shredded and frozen for winter. I do so in zip-top bags that can be flattened in the freezer, in 1 and 2 cup increments. Then all winter I can pull them out for zucchini bread or zucchini pancakes (a family favorite) and get a taste of summer. Also, it helps spread out the zucchini instead of trying to use the glut up all at once. Last, I like making this during zucchini season. Yum! Yesterday my DH made dolmas from the wine leave of his own wine plants. Also, zucchini can be shredded and frozen for winter. I do so in zip-top bags that can be flattened in the freezer, in 1 and 2 cup increments. Good to know- I was just wondering if this would work! We have been eating massive amounts of shredded/salted zucchini sautéed with lots of butter and occasionally garlic/parm. When this gets old I'll start freezing it for the winter. I discovered last night that a) I nearly killed my tomatoes from lack of water and b) I have a bell pepper!! This is the first time I've tried growing any peppers so I'm excited by even the one. Also, the tomatoes have been properly watered and are recovering. They're also tomato-ing away, and so far I've collected about 3.5 oz. of tomatoes (in other words, just a few), with lots more on the bushes. I harvested three giant zukes, 3L basket of beans, cilantro and three green peppers. Especially proud of the peppers because I grew them from seed. I planted some lettuce, beets, carrots and basil seed for fall harvesting. I have also decided to give up my allotment garden at the end of the season. The garden is pretty disorganized and some of the rules are draconian while some things that I think are important are not getting addressed. There is a rule that we aren't supposed to fence our individual plots but the perimeter fence is not bunny proof. And I lost some plants because a human trampled through my plot. The rain barrels are not hooked up but no one knows the code to the shed they are contained in. But we are not allowed to haul water from the river. It is a bit sad because I have got amazing soil through hauling wheelbarrows full of manure from my dad's farm, my compost bin and bags of leaves from my driveway. Kids have given me permission to remove more turf and the neighbour has allowed me to take over the area in front of the greenhouse. I am glad I made the decision now so that I can plan my garlic planting for the fall and move the strawberry plants to my house. I am going to move a bunch of my flowers around to make an equivalent sized plot for veggies in the sunniest area of the front lawn and then I can do exactly what I please. Anyone in NC area have any fig trees? Are they hard to maintain? I've read differing things on the internet and looking for some experiences at this point. Our normal strawberries has stopped to produce strawberries. Butvthe bushed with forest strawberry are still producing a pile of berries. They will continue to do so the while season. I am going to dry them to add to the boring muesli on our future hikes. Two of our tomato plants seem to have early blight. Soo.... chopped away a bunch of those branches in the hopes of letting their fruit mature. Peppers are looking better and better. I was originally worried about an overall anemic crop but multiple plants have 10+ fruit growing on them now (after doing what appeared to be nothing for nearly 2 months). Also, is there something absurdly good about Early Girl tomatoes? We have gotten twenty pounds of them already from just two plants. I mean I am not going to complain but that seems ridiculous. Our green beans have been dying for weeks and yet producing still. We ripped out the peas a month ago and were going to take the green beans then too, but they keep on trucking even though they look horrible. I think I forget that it is only mid August (in Zone 5). So we likely are going to get insane amounts more yet too. Going to be great! Almost 100# this year already and we are easily going to blow through that if not 200 pounds. Something is eating my tomatoes before they are ripe. Back up go the rodent barriers to see if we can't get some tomatoes. My Early Girls have always been crappy producers, but I seem to be the outlier on that one. Does EVERYONE have early blight this year?! I've never seen anything like it. Most of the tomatoes in others' plots, in my community garden, have it. I know it can spread quickly in close quarters like we have. I still have it, but my plants are still producing so I'm just trying to remove the affected leaves as I can. Ferrum, are you planting tomatoes in the same spot each year? Because apparently the blight can get into your soil. So you're supposed to move them elsewhere for a year or two. I can't do that as I've just got the one plot, and I'm not going to skip tomatoes entirely for a whole year! From the small backyard raised bed, I am now getting HUGE Cherokee Purples and Mortgage Lifters. HUGE. The romas are ripening, but I'm disappointed in their flavor. They are pretty tasteless, to be honest. WTF? Oh well, I'll throw 'em in sauce with other varieties. We do on a few of them. I hacked them to pieces though to hopefully protect the rest of them, as in removing nearly all the branches in hopes that the large clusters of remaining tomatoes survive. Effing blight!!! Most of my tomatoes got it. And yes, same plot every year. Cannot move it. I do, however, plant extras in various places around the backyard - and those seem to be less affected by decease. Cucumbers - same thing, most bottom leaves are gone now. Canned 6 quarts of salsa this weekend. 4 smoked 2 oven roasted. Using jalepenos Roma's and cilantro from the garden. Worst year for blight I've ever seen this year. And yet I have absolutely no blight in the small raised bed and containers in my backyard. That's all new soil, though. Maybe conditions this winter were such that it didn't kill off all of the nasty stuff in the soil? (We didn't have a proper winter; not too cold and nearly no snow). Just throwing ideas out there. Many of ours are now showing early blight signs. I pruned a massive chunk off one of our early girls (which I think is still going to produce 5+ pounds even if the blight gets it). Up to 60 pounds of tomatoes harvested, about 11 of that is cherries. So even if the blight kills all our tomatoes we're going to get a ton still. Also pruned a few peppers which had bad looking leaves on them. Many of those plants now have considerable numbers of fruit, so if those all produce we'll have a great crop of them too. And 4 cantaloupe are growing somehow! Will be curious to see if any of those mature. Harvested ~5 pounds of tomatoes this morning and am cooking them into sauce right now. Also picked about a dozen peppers that will be pickled tomorrow. This is after of a larger harvest on Sunday. My DW especially likes the Cherokee Purple tomatoes. They are reserved for snacking. Grapes are almost ripe. Edible now but still quite tart. It was a good year for the green grapes but the purple ones only have a few clusters. This is a reverse from our usual harvest. We are also going to be eating butternut squash every week this winter. The second round of raspberries is in full swing, but we could use some rain. Oh man, I went to the community garden last night after work and the blight got BAD, overnight. :( I gave all the plants a good haircut. Some of the yellowed branches were coming off right in my hand. WTF? Made heirloom tomato salsa last night with my huge cherokee purples, creme brulees, and mortgage lifters. And some hot peppers that were still in the freezer from last year's harvest but seem just fine. Yum! Just to see what would happen, I threw some lettuce seed in the community bed to see if I can try for a fall crop. And it's coming up! In past years I was never successful at fall greens; they never germinated. Hopefully I'll get some fall lettuce this year, then. Hi all. Does anyone know what's up with my tomatoes? A lot of the lower leaves look like this. I appreciate any input. Thanks everyone! Kale has aphids! Diagnosed by a gardening friend. Will strip the plants of leaves, spray with insecticidal soap and wait 2-3 weeks for the plants to regenerate. Oh and apparently we need to fertilize with a fish emulsion. Hoping to extend the kale harvest well into fall. Looks like blight to me. Being that it is on the lower plant leaves, blight can be transferred from "splashing" of rain onto the soil and up onto the leaves. Those leaves also get little sunlight which blight likes :). We harvested our potatoes last night. I only had a few plants, and I was trying a new method. (A potato box thing--I think I put up a picture earlier in this thread?) The soil, such as it was, was pretty poor, mostly mulch, and I only hilled them once. Well, we got a little over 8 lbs of potatoes, so not too shabby, especially considering the serious lack of care I put into these plants. And my daughter had a ball finding the potatoes and pulling them out as I sifted through the dirt with a pitchfork. Next year, I want to have a big potato patch, plus the box. We also harvested some tomatoes, almost up to a pound total of those (romas and cherry tomatoes, so they're small) and we've got a few more zucchinis springing up. Last, I checked on my onions. Some of them are nearly twice the size they were just two weeks ago, so I guess they've finally decided to make their final push to get bigger before fall. Yay! Coming up soon: harvesting apples. I can them as sauce and we press our own cider (hard and sweet). Yum! Afraid I agree - that's early stage blight. Another 13 pounds of tomatoes today (last harvested on the 15th, so what... that's 4 days ago?). Up to about 75 total this year, yay! Blight is looking bad. But at this point we're going to get more than enough fruit even if all them get blighted. I hacked away TONS of branches again today, both blighted as well as extra. Our Early Girls don't look like they have much blight now (after a massive pruning a few days ago) so fingers crossed there. But a few other plants picked up traces of it. I guess we'll see what happens. Good for you! I've harvested about 60lbs so far. I'm in the southern local so I don't have but maybe one more good harvest. Probably end up with about 70lbs. I was hit hard by the white moth larvae. I did massive pruning. Then blight set in just a few weeks ago. I'm yanking everything next week and planting fall veggies. We've got a bunch of peppers that look promising but I'm hoping to end up with around 100# of tomatoes. Will be a nice haul, should last us a year, but I do like putting them in lots of things... so we'll see. OK - let's get this party started! What did you learn from past years? Best tips to pass along. I am trying to grow tomatoes (indeterminates i think, they're getting big) in containers. Staking them has been tough though, i am using strips of t-shirts to tie them but they seem to slide down and don't really serve their purpose. interestingly, the immediate area around where the containers are located seem to be really getting weedy. i assume this isn't a coincidence. i am also trying to grow herbs but starting them outdoors, in rainy season in south FL, seems to be a mistake. If anyone is looking to use up some tomatoes I recommend the "Tomato Pie" recipe from the Hoosier Mama Book of Pie. It is intense tomato-ey goodness. Bonus - you can double the filling recipe and then blend up the second batch for sauce in the "Chicago Pie" recipe which is also excellent. Actually made tomato pie last night! Still getting tons of 4th of July tomatoes. Also, still harvesting bell peppers and jalapenos. I can't tell you how many jars of hot sauce I've given away. Looking forward to getting my seeds for fall planting- spinach, peas, carrots, garlic and turnips. Can't wait! Community garden bed officially looks like poo. Still getting tomatoes, but the plants look the way they usually do around mid-October. Very sad. It's making me not want to go there and continue to tend it, but I still do. Backyard is still churning out loads of romas, cherries, and the Red Prides finally started to ripen. Some are really large. Still getting some big heirlooms too. I had to throw out a Mortgage Lifter that I left on the counter too long. It had a split in it that I didn't see and got moldy and liquefied. Ew. A question on blight. So, everything I read about it says you have to rotate your crops or else you'll get it again next year. I don't have another place to plant, though, and I don't want to give up tomatoes entirely for a few years. (One thing I read said plant nothing in the tomato family for FOUR years?!) What would happen if I emptied out much of the soil from the bed and replaced it with fresh? Would that help? Every year I top off with fresh compost, but the same soil is still in there underneath (and probably has been for as long as the community garden's been going). Has anyone successfully done this? Because, it's going to be expensive and I don't want to make the effort if it won't actually help. I planted fall spinach but it didn't come up, booo. The fall lettuce is up but not really growing. It's gotten cooler these past few days, though, so maybe that'll make it happy. I ordered lettuce, spinach, and carrots for my fall/winter garden. Going to make some low tunnels over my garden beds so that everything will grow faster and nicer than it did last year, out in the open. My spinach made it through all of the frosts, but it grew so. slowly. I actually want it to be harvestable over the winter this year. I'm now over 1.5 lbs of tomatoes. :) That's nothing compared to some of your harvests, but the few plants I have and the profound neglect they've suffered at my hands means I'm happy to get anything at all. I have enough ripe cherry tomatoes that I think HusbandX and I will be hipster Millennials and make avocado toast this weekend. Never tried it, but it looks yummy. Sorry, no advice on blight. So far blight has been annoying but not "entire crop ruining" - I think for next year I'll just plant more Early Girls (which mature... early) and just keep a watchful eye out. If blight had completely devastated our crop I would be more worried. But it's been slow attrition and realistically I probably should be pruning them anyways. Yeah, my plants in the community bed aren't dead and I'm still getting tomatoes, but they look BAD. Very spindly compared to the lush forest that I've got in the backyard. So, not devastating but my yield is much less than in past years. Most tomatoes in our garden are looking blighted. I pruned another massive pile of affected leaves today though and that seems to be pretty effective at curbing the onslaught. I'm... not that worried now either, as our freezer is mostly full and at this point most of the tomatoes we harvest are going to salsa with the peppers. It's been a very successful garden year so far even if everything dies a horrible death right now! My banana peppers are still green, but they are enormous! I am excited! 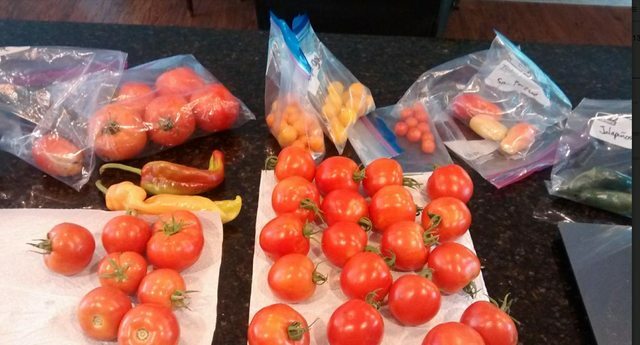 I'd hoped to be able to can enough tomatoes to get us through the winter and spring, but that does not seem likely as my yield is much less than last year and we ran out of my home canning in February. Ah well. Getting to be pretty regular 10 pound plus hauls from the garden. Almost 14 this time and that's without cherry tomatoes (or a final-final-final bean crop from the BEANS WHICH WONT DIE). Blight looks less bad now, other than the first two where I didn't do much pruning seems to have stemmed the spread of blight, though some of the tomatoes seem to have spots (which we'll cut out of course). Our two early girl plants have now produced a total of just under 37 pounds between the two of them. WOW. And they have a bunch more on them now, too! Pepper crop is looking great. Going to have a ton of them compared to my expectations given how many are out there. Already harvested ~2.5 pounds of Jalepenos (that's a lot of them) from our single plant! No one has updated this for almost two weeks (!). Pulled another 6 pounds of tomatoes today. Up to 120 this year now.. that's a loot. Our recently purchased 22 cubic foot freezer is looking full already with our garden harvests. Plus I pruned about two wheelbarrow loads of tomato leaves/branches that were showing any signs of blight. First signs in the garden were a month ago, the plants that showed them are pretty bad off but the ones I have been aggressively pruning seem to be in good shape! Peppers are going to be a great crop. We'll use a bunch for salsa and the rest will get frozen for stir fries! I've run out of freezer room and I don't can. I have 15 tomatoes sitting on my window sill and I'm at a loss. I hate to say it, but I'm a little tomato'd out. I'm sort of debating whether or not to fight the blight or just let the tomatoes go since I have more than I can use. My last two weeks worth of green beans, cucumbers and peppers have all gone to a local foodbank. Our community garden has a neat option to send everything to a food kitchen once a week. The only thing that are getting eaten with regularity are the cherry tomatoes because my kids are still eating them by the handful. Will probably finish planting fall greens this week in my emptied 4x4. Getting lots of big beefsteak tomatoes right now. I've dried several dehydrator loads of tomatoes, canned some whole, canned some soup, and a big batch of salsa today with roasted bajio chiles. I gave away at least 20# at work last week, and have probably 25# spread out in the kitchen in various stages of ripeness. Chiles are HOT this year. I also made a batch of sambal olek this afternoon, and picked and roasted a bucket of green chiles last night. The chocolate habaneros are absolutely scorchingly hot. Cayenne peppers will come in next - I'm thinking about doing a fermented Tabasco-style sauce, as well as cayenne powder if I have enough. There is another whole large batch of Thai chiles ripening as well. I've gotten several nice honeydews, and have cantaloupes ripening. The spaghetti squash was the only winter squash to survive, but it looks like it will give me at least a dozen squash to store. Potatoes - I've dug about 10# of blue and fingerling potatoes. I've got cabbage, broccoli and kale going for fall, and just took the shade cloth off of them a few days ago. Hoping for some nice production there, as well as from the few carrots that managed to survive a summer planting. I'm hoping to get some salad greens in the ground in the next few days as well. I also noticed new sugar snap pea plants popping up where the peas were planted this spring. Not sure if they are re-sprouts, or from seed, but I'll be interested to see how they do, as I've never had luck with fall-planting peas. Things are more or less the same in my garden. The community plot still looks like poo, but is still making tomatoes. My sungolds had quit for a while, but now are churning out another round. In the backyard, I think the Roma's about done, but the heirlooms and cherry tomato are still bearing lots. The peppers are taller than me now - too bad that they're just deciding that now would be a fine time to start making peppers. No way are those going to ripen before it gets cold out. Oh well. Looks like I'll get some fall lettuce soon; I planted a "gourmet blend" of red and green lettuce, from seed, and it's starting to come up. And, I have a volunteer dill plant growing just outside my community bed! Perfect timing as the dill I planted intentionally is about done. I have no idea what to do about my raspberry bushes. It's my first year having them. One has just grown in 1 long stalk that's got to be about 8 feet long. It's growing sideways, not up. That one didn't bear anything. The other is fuller (and did make probably 20 or so raspberries in July-ish) but is starting to do the same - putting out long sideways stalks. Can I cut those down or do I have to leave them so that they make berries next year? I have these in huge pots and their branches are growing into all the native ornamental plants that my landlord has in the ground, but I've really no good place to move them.